Explore the wonders of the Islamic world in the Museum’s newest gallery. Showcasing the Museum’s diverse and world-class collection of Islamic objects, this beautiful new gallery explores the cultural significance, breadth and impact of the Islamic world. On display are stunning works of art alongside objects of everyday life, including musical instruments, games, ceramics and traditional dress. 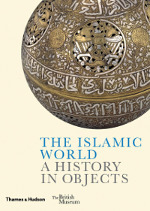 These objects represent an area stretching from West Africa to Southeast Asia, from the 7th century to the present day. Together they celebrate the peoples of the Islamic world and explore the ideas, technologies and interactions that shaped their culture. Star tiles made of painted stonepaste with an opaque glaze. Iran, probably Kashan, AD 1266–67. Gilded and enamelled glass lamp. Egypt or Syria, 1330–1345. Astrolabe, made of brass inlaid with silver and copper. Probably southeast Turkey, northern Iraq or Syria, AD 1240/1. The Hamzanama, Elias and Prince Nur ad-Dahr, ink and opaque watercolour on cloth. Mughal style, India, 1564–1579. Uzbek woman’s ikat coat made of cotton and silk. Uzbekistan, 1870s–1920s. Ottoman dynasty İznik basin made of painted and glazed stonepaste. İznik, Turkey, 1545–1550. Early kufic script inscribed on marble. Egypt, AD 967. Sudanese lyre made of wood, skin, glass, cowrie shells, metal and animal gut. Sudan, late 1800s.